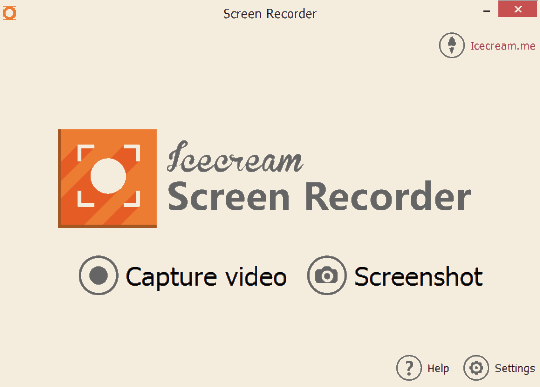 Icecream Screen Recorder is a free screen recording software that comes with screenshot capture feature. Thus, you could record desktop screen as well as take snapshots of any required part of PC screen. 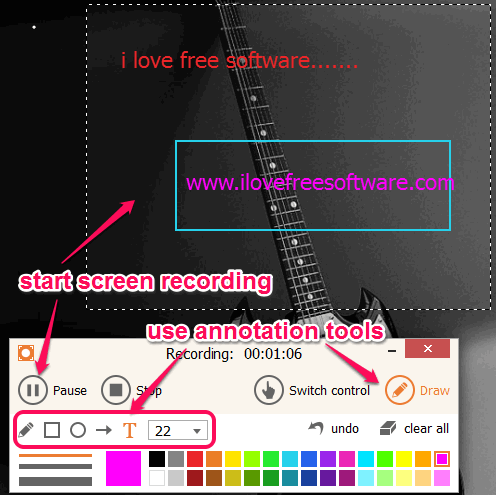 In comparison with many similar screen recording software, it provides unique feature to add annotations during video recording . That means, you could add text, circle, rectangle, or can draw freely (with free hand tool) on recording area. 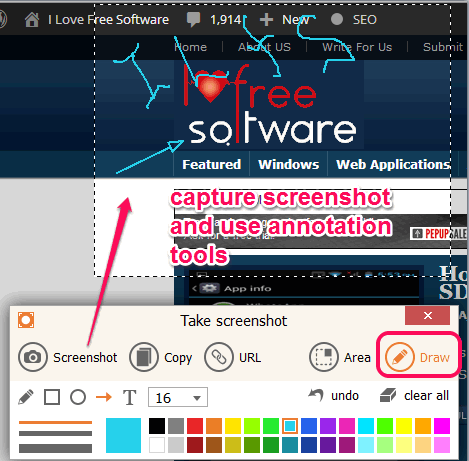 You can also use annotation tools for captured screenshot. Icecream Screen Recorder sits silently in system tray and lets you record or capture desktop screen. You can save video recording in mkv format. And to save captured screenshot, it supports PNG format. In above screenshot, you could see its interface where both features are available to use. Note: During video recording, desktop icons will become invisible. It is by default setting. You can change this setting whenever needed. Other free Icecream products: Icecream Ebook Reader and Icecream Media Converter. How To Use This Free Screen Recording Software? You can use the link present at the end of this article to download its setup file (47.4 MB). After completing the download, execute the setup file. Installation is very simple for this free screen recording software as only basic steps are required to complete the installation. After this, open its interface, and use the required option. To record desktop screen, you can use Capture Video option present on its interface. You can select the required area and start the recording. Do note that you won’t be able to move the recording box once the recording is started, so choose the right place. During the video recording, you can use Draw button that will explore annotation tools. Free hand tool, text tool, rectangle tool, arrow tool, and circle tool is available. Use these tools with any of your favorite color and make screen recording more meaningful. It is very helpful when you have to explain something on recording area. While recording the selected part, focus will remain on that part only. That means, you won’t be able to use other applications or windows. But you can Switch control to access other applications and record in the recorded part. As soon as the recording is completed, click on Stop button. This will store recording to default destination location in mkv format. Another handy feature of this software is that you can capture a particular part of desktop screen. After capturing the desktop screen, it will provide you similar options that comes with video recording. You can add text, draw free hand, add rectangle, etc. to capture screenshot. After enhancing the screenshot, save it to PC using Screenshot button. If you want, you can also upload your screenshot online on icecream.me. Unique URL for your screenshot is also generated. That URL can also be shared with any person. You can record audio with video recording. Microphone is required. It saves history of each and every project created by you. You can change destination location for storing screenshots and videos. Use Settings option. Icecream Screen Recorder is one of the best screen recorder. As it lets you add annotations to recording and capture screenshots, it can be used for multiple purposes. Get Icecream Screen Recorder free.